News apps like Google News, Flipboard, BBC, Inshorts show trending articles written a day or two back. If say there are hundred articles written in a day, these news apps pick just a few of them. It is a time saving feature. But they lack a key flexibility. Consider you haven’t read any news for the last 1 month or 1 year. If you open any of the news apps or news websites, you will still be shown trending articles written a day or two back and not last month or last year. Hence I and my friends(Domnic Amalan, Deepak, Rejo) have created https://www.condense.press. It picks popular articles of a website in a time range we specify. For example, techcrunch.com has 292,172 articles. But https://www.condense.press sorts all those articles based on popularity. 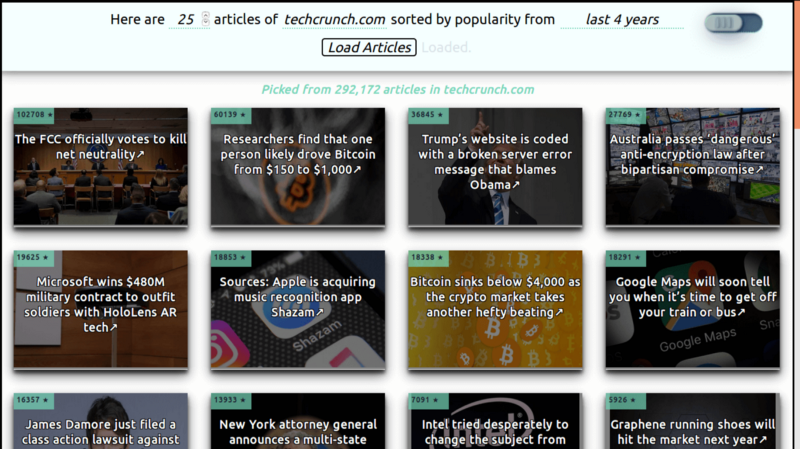 Below is the screenshot displaying most popular articles of techcrunch.com written in the last 4 years. Do you find https://www.condense.press useful?